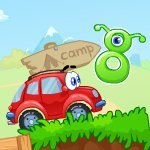 Help the machine in the game Wheely 8 to overcome all obstacles and logical puzzles to get to your goal. In addition to the main task, you need to find hidden secrets. Can you pass all 12 levels to the maximum 3 stars?